attacking the U.S. bunker at An Loc, April 13th, 1972. There are episodes in the history of warfare which define the turning point and change the way wars are fought. On April 13th, 1972, The North Vietnamese launched a fierce attack with approximately 40 tanks and supporting troops upon the provincial capital of An Loc, eighty miles north of Saigon. The town was defended by South Vietnamese troops and a small contingent of American advisors, commanded by Col. William Miller, US Army. The defenders were quickly overwhelmed and the situation described became desperate. A column of Soviet made T-54 tanks had penetrated the defenses to within a few yards of the American Command Bunker. Fortunately, the 1st Calvary Division, Battery F, 79th Artillery, otherwise known as the Blue Max, was on station. Two AH-1 Cobra Attack Helicopters responded, crewed by CWO Barry McIntyre, Major Larry McKay, 1/Lt. Steve Shields, and Capt. Bill Causey and were armed with the newly developed HEAT 2.75" rockets, which had never been tested in combat. In a daring and entirely untried manuever, the Cobras rolled in and attacked the three enemy T-54’s that had approached to within a few yards of Col. Millers Command Bunker. The first 2.75" rockets launched by McIntyre and McKay destroyed the lead tank, halted the attack, and began what can be accurately described as a rout by the Blue Max. With this bold action, McIntyre and McKay became the first helicopter pilots in history to destroy an enemy tank and demonstrated the lethal capability of the Attack Helicopter as a weapon that would entirely change the face of war. In The Defense of An Loc artist Dru Blair brings to life this turning point in history. The three T-54’s threatening Col. Miller’s bunker are seen at the moment that the first pair of rockets impact on the lead tank. The product of extensive research. The Defense of An Loc was assembled from interviews with eyewitnesses and aerial and ground photos taken during the battle. A Limited Edition of only 750 prints, The Defense of An Loc is reproduced on 100 lb. Museum Quality Archival Acid Free stock, and is individually inspected and signed by the artist. A Certificate of Authenticity is provided with each print. 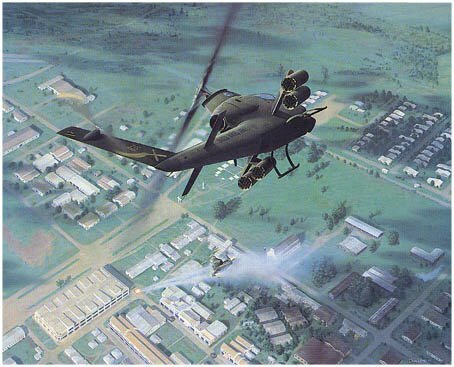 In addition, each print is countersigned by Lt. Col. McKay (RET) and CWO McIntyre, "Serpent 6", the crew who were responsible for the first successful helicopter attach upon an armored force, and Col. William Miller, "Tunnel 10". US Army (RET), the senior ground commander at An Loc.